MCG Textiles Afghan. 18 count, 100% Acrylic fiber. Measures approx. 45 x 58". The squares measure approx. 5" each. There are a total of 63 squares. Machine washable and drys wrinkle free (unlike cotton afghans.) There are 18 threads per inch but most commonly stitched over two threads resulting in 9 stitches per inch. Woven of washable 100% acrylic fibers. Stripes have been woven into the fabric dividing the fabric into 5" squares. 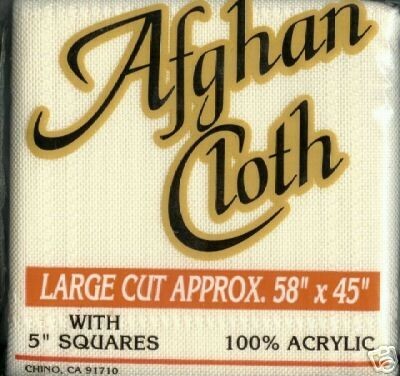 Contains enough fabric for a full-size afghan or it may be cut in half to make two baby afghans approx size 29" x 45". Prepackaged.